Russia – Alone at the Table? Browse: Home » 2017 » May » 22 » Russia – Alone at the Table? 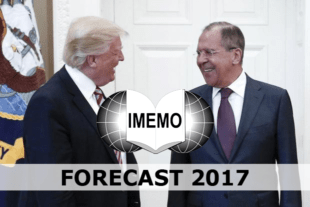 IMEMO, Russian Academy of Sciences ‘Russia & The World’ 2017 Forecast. Download the full IMEMO forecast here. For the third successive year, New Perspectives is delighted to publish, exclusively in English, the annual ‘Russia and the World’ Forecast from the IMEMO institute of the Russian Academy of Sciences. As ever, this forecast provides a unique insight into Russian foreign policy – and global affairs – from a Russian perspective. There are some striking claims in the forecast including those made over the prospects of the EU and the Liberal West more widely in the face of domestic revolts seen as being driven by the inequities of Western-designed globalisation. The IMEMO analysts ascribe this revolt to “fear of globalisation”, rather than “value aspects” such as rejection of “gender equality, gay rights, ethnic diversity, and environmental protection – promoted by [liberal, Western] elites,” and which it claims are “of secondary importance.” This is particularly interesting given the Putin regime’s frequent ‘values-based’ denigrations the ‘decadent’ West. The forecast contains much uncertainty about what to expect from the Trump regime and what effect it will have on the practice of international politics. Ostensibly, however, there is little uncertainty, over Russia’s place in the world (a great power) or what kind of world that is – and should be (one ruled by the timeless, iron laws of great power politics). However, there is also a somewhat plaintive tone, in which the assertions of greatness ring somewhat hollow. Despite the claims made for the Eurasian Economic Union and Russian soft power, the annexation of Crimea (euphemistically described as a “re-unification”) has not been followed by other parts of the former soviet space clamouring to ‘re-join’ Russia. Despite doing down its prospects, the West is still desired as a partner. Despite claiming to have accepted it’s role as China’s junior partner, Russian analysts still see the need to balance against Chinese influence and threat. Despite having supposedly sorted out many of its own problems, Russia finds itself “alone at the table” as its potential negotiating partners are seemingly distracted by domestic concerns. The forecast notes Russia’s resilience in the face of significant problems (including economic ones of its own making) but laments the decline of “traditional international formats” against the backdrop of a “degrading world order” and increasingly “influenced by peripheral interests and provincial thinking” and the ‘politicisation of geopolitics’ by domestic considerations. It is interesting to speculate what might happen to Russian foreign policy (and foreign policy thinking) if the current Russian regime were also forced to take domestic concerns seriously.